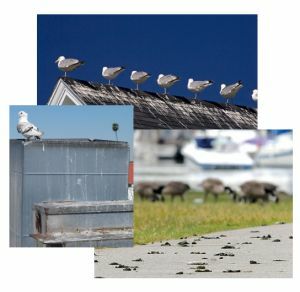 Flocks of birds, particulary pigeons, starlings, seagulls and geese cause considerable damage and recurring costs for cleanup. Not only are their dropping offensive to the eyes and nose, they are caustic enough to damage paint, metals, and plastics. Sonic Nets can deter birds from gathering and significantly reduce damages and the costs for cleanup.